Please note that the 5 drawer steel flat file and high base featured in the video below are sold separately. 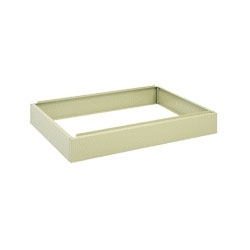 Sturdy all-steel base raises file off floor for protection and easier access. Front is recessed 2-3/4". Holds up to five 5-drawer files. Durable powder coat finish with very easy assembly. Dimensions: 40-3/8"W x 26-5/8"D x 6"H.
For use with Safco Model 4994 (5-Drawer Steel Flat File for 24" x 36" Documents) sold separately.